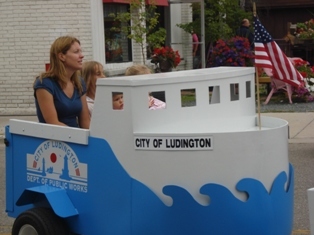 Ludington's fondness for its iconic Lake Michigan Carferry prompted city officials to create a children's flotilla that's a miniature replica of the historic S.S. Badger carferry. This flotilla makes frequent appearances at local family events. Cary Shineldecker, a local resident and engineer at Precision Design, was approached about designing and coordinating this project. His love of the community prompted Shineldecker to donate his time and talent to this creation. Dow Chemical generously donated a lawn tractor over which the "ship" would sit, and GLC Metal Fabricators went to work on the steel fabrication. Then Lake Painting provided the sandblasting and painting for the project. Once this part was done, the Department of Public Works built the boats that attach to the back, with graphics done by Tye's Signs and Northwood Signs. To cover the city's costs, local businesses sponsor the individual boats that the children ride in. 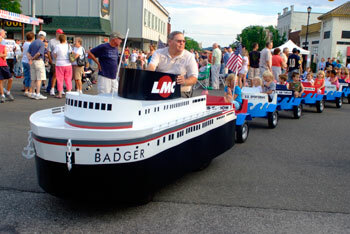 The Baby Badger, as it is affectionately named, made its debut at the first of four Friday Night Live events in Ludington July 18, 2008. It was a huge hit, and the boats were constantly filled with children as city and carferry officials maneuvered the ride through the streets. Former mayor of Ludington, John Henderson, felt this was another wonderful project for the city, and that the combined community effort made it all possible. Look for the Baby Badger flotilla during the Freedom Festival Parade, Friday Night Live, Movies in the Park, and many other events during the summer.